Artistic Insight: Read about the Caribbean artist movement, their formation and aims. The Caribbean Artist Movement (CAM) was a London-based creative grouping formed of writers, artists, filmmakers and musicians of Caribbean heritage that formed in 1966. Artists from the exhibition who were a part of this cultural initiative include the likes of Winston Branch, Aubrey Williams, Ronald Moody, Errol Lloyd. The movement illustrates the cultural cross-over of the time and the attempt of Black Artist’s, grouped through commonality but not defined by their heritage, to assert themselves in the visual sphere. From 1947 onwards, following WW2, there was an influx of migrants from various Caribbean islands. Desiring to study, responding to the post-war labour shortage and the economical depression of the West Indies, the migrants came from all social spheres and backgrounds. England offered an opportunity for these individuals to interact, unrestricted by distance and geography. Despite the wildly disparate cultures, traditions and social and political structures of the different West Indian nations, migrants were often united in this foreign England. Wishing to establish their creative positions, and Caribbean- African heritage, in a new cultural environment, CAM was formed. Writers John La Rose, Edward Kamau Braithwaite and Andrew Salkey were two of the principle founders of the movement. Salkey was extensively published by Bogle –L’Ouverture Publications and was a close friend of the Huntley’s, who too were members of CAM. As well as grouping together artists, amalgamating skill and creativity, CAM wished to offer a reassessment of West Indian art of all forms, offering a critical framework that was more appropriate than the prevailing European tradition. The Caribbean artist movement, in its inception, often reflected backwards to its Caribbean heritage in various forms, but as time went on and a new Black British identity emerged. racial assumptions and academic limitations. 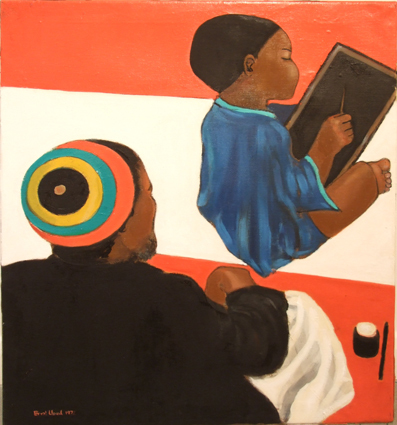 The Caribbean Artist Movement is also crucial in the overall understanding of Black cultural practices of the time as it demonstrates the dialogue between various mediums and practices, how word and image were closely related and combined in order the strengthen the themes and transmission of ideas.